Picasa has a neat feature in 'Effects' section in turning a colored photo to b&w. I normally ues the b&w in "Effects." But there is more in Picasa filtered b&w in that it allows you to filter on color channel. 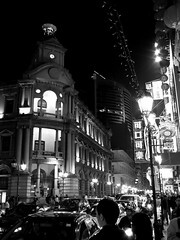 For instance, for the picture that I shot in Macau night pictures, I have a lot of yellow tungsten light and I can use filtered b&w to filter on the yellow color. And filtering on green color usually gives the best in noise reduction in the final b&w picture. Very neat and easy to do in Picasa. 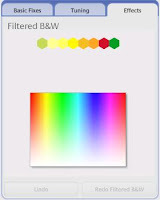 In the color picker, you simply need to pick a color channel to filter the b&w picture on. As you move the mouse over different color in the picker, you can see the changes in the picture.